Executive vice-chairman of the Nigerian Communications Commission (NCC) Prof. Umar Danbatta says broadband access is critical for national development and should be treated as a key economic indicator. Danbatta stated this during the ICT Watch Network Award Ceremony held on Friday in Lagos, with the theme: ‘Broadband Access: National Scorecards and Roadmap to 2020’. According to him, broadband deployment has a strong impact on GDP, employment and productivity in all economic sectors. “It can be seen all over the world that there is a higher economic growth in countries with more broadband penetration than in countries with less broadband penetration. “Hence, governments and regulators worldwide are strongly in support and make every effort in promoting broadband deployment, in order to stimulate the development of the economy and the society. “The International Telecommunication Union (ITU) advocates that broadband should be treated as an essential service like electricity and water; it is difficult to imagine life without water or electricity,” he said. 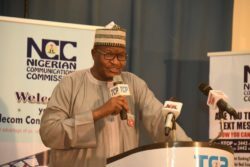 Danbatta assured that the commission would continue to drive and support high-speed broadband connectivity to end users through various initiatives. He said that initiatives such as licensing of InfraCos, on a regional basis, provide metropolitan fibre and wholesale transmission services on a non-discriminatory, open-access and price-regulated basis. The EVC said the roadmap was to have fibre point of access in every local government area in in the country within four years of the commencement of deployments in each geopolitical zone. The News Agency of Nigeria (NAN) reports that 2.3GHz spectrum has been licensed for wholesale wireless last mile services. According to Danbatta, there are ongoing discussions with various levels of government to facilitate speed in processing permits, harmonisation of tax regimes and to ease the deployment of infrastructure, including streamlining right of way charges. He said that there were also limitations and access gaps in metro fibre deployment to nodes, neighbourhoods and last mile connection to homes and businesses, which the government needed to address. “Since spectrum is a critical mobile infrastructure, the commission will strive to provide the required frequency spectrum capacity. “The commission will facilitate the re-farming of existing spectrum held by operators to provide broadband services without impacting their quality of service delivery. “We will open up and assign other spectrum bands in an open and transparent manner,” he said, adding that the availability of broadband infrastructure will unlock new opportunities and drive a second wave of growth in the telecoms industry and the economy.